NEW YORK, Sep. 20 /CSRwire/ - As a founding partner of the White House Call-to-Action for private sector engagement on the global refugee crisis, the Western Union Company (NYSE: WU), a leader in global payment services, today announced expanded participation. The Western Union Foundation has pledged a three-year grant support totaling USD$ 750,000 to the Whitaker Peace & Development Initiative (WPDI) that will help provide access to education for 10,000 refugees in Uganda. During a White House Call-to-Action meeting today in New York, Western Union CEO, Hikmet Ersek reaffirmed exploring the opportunity to use Western Union’s cross-border platform, marketplace voice, charitable giving and talent to help refugees participate more directly in the global economy. Western Union’s support will extend to include education, employment and enablement initiatives. Western Union’s White House Call-to-Action program includes looking at ways to expand access to education for refugee children and young adults, leveraging Western Union’s products and services to implement refugee crisis response initiatives, and proactively striving to make job opportunities available to refugees via traditional employment and shorter-term assignments, such as internships and freelance opportunities, with Western Union and teaming up with key corporate partners. The Western Union Foundation’s three-year commitment to WPDI, the non-governmental organization created by Forrest Whitaker, represents the first step in this multi-year effort. WPDI’s successful approach to training refugees focuses on life skills, vocational training and entrepreneurship. This will serve as a blueprint to implement a new program in a camp in Kiryandongo, Uganda where the UNHCR reports that approximately 70,000 refugees and asylum seekers from Kenya, Congo, Rwanda, Burundi and South Sudan reside, 85% of whom are under 18. Uganda hosts the eighth-largest refugee population in the world, third-largest in Africa. The Western Union Company (NYSE: WU) is a leader in global payment services. Together with its Vigo, Orlandi Valuta, Pago Facil and Western Union Business Solutions branded payment services, Western Union provides consumers and businesses with fast, reliable and convenient ways to send and receive money around the world, to send payments and to purchase money orders. As of June 30, 2016, the Western Union, Vigo and Orlandi Valuta branded services were offered through a combined network of over 500,000 agent locations in 200 countries and territories and over 100,000 ATMs and kiosks, and included the capability to send money to billions of accounts. In 2015, The Western Union Company completed 262 million consumer-to-consumer transactions worldwide, moving $82 billion of principal between consumers, and 508 million business payments. For more information, visit www.westernunion.com. The Western Union Foundation is dedicated to creating a better world, where the ability to realize dreams through economic opportunity is not just a privilege for the few but a right for all. 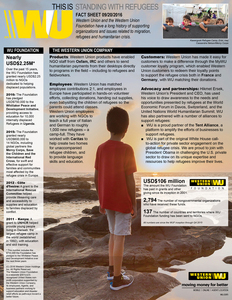 Through its signature program, Education for Better, and with the support of The Western Union Company, its employees, Agents, and business partners, The Western Union Foundation works to realize this vision by supporting education and disaster relief efforts as pathways toward a better future. Our combined social ventures efforts make life better for individuals, families and communities around the world. Since its inception, The Western Union Foundation has paid more than $106 million in grants and other giving. These funds have been pledged to more than 2,794 nongovernmental organizations in more than 137 countries and territories. The Western Union Foundation, is a separate §501(c)(3) recognized United States charity. To learn more, visit www.westernunionfoundation.org, or Follow us on Twitter @TheWUFoundation. WPDI is a non-governmental organization with an international scope and reach, founded by Forest Whitaker in 2012. WPDI develops an array of peacebuilding programs, initiatives and campaigns to foster peace and reconciliation in disadvantaged and fragile communities in Africa, Latin America, and the United States. Our mission is to help societies impacted by destructive conflicts transform into safer and more-prosperous communities. Visit us online at www.wpdi.org and follow us on Twitter (@connectWPDI), Facebook, and Instagram (whitaker_peace).